A shocking statistic that will surely have all bikers quaking in their leather boots, and motorbike theft is also a major problem in France with around 85,000 bikes being stolen each year. Whereas 16% of stolen bikes are recovered in the UK just 9% are recovered in France. A survey conducted by the National Crime Intelligence Service showed that it takes only 20 seconds to steal a motorbike worth £10,000. Sickening statistics for all bikers, this survey also revealed the UK hotspots for motorbike theft with Central London, West Yorkshire, West Midlands and Manchester coming out on top. Thefts are generally carried out in Urban areas and 80% of stolen bikes are taken from the owner’s home, showing that bike owners need to invest in more stringent theft prevention methods such as solid lock-ups or improved alarms and immobilisers, which will all act as deterrents to thieves. Statistics from 2011 showed that in France – a country renowned for favouring motorcycles of all varieties from race-replica street bikes to city run-around scooters – eight motorcycles were stolen every hour, and the same research showed that Paris was the city where your bike is most likely to be stolen from. Many victims of theft are left with very little help from the police force who are simply unable to assist with the number of thefts, and those affected are forced to attempt to recover their bikes themselves by searching the city or advertising their stolen bikes. 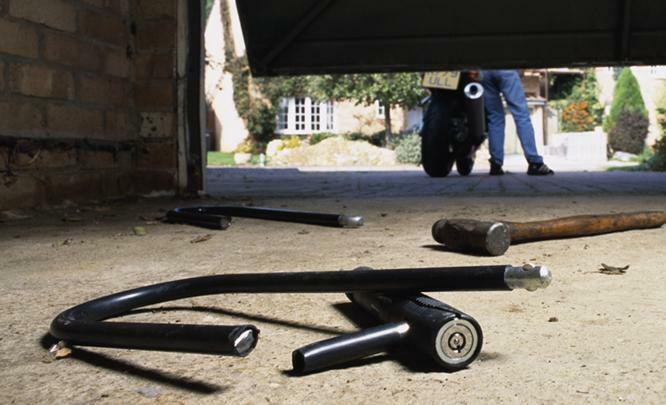 Gangs who go around targeting what they see as “easy steals” make motorbike theft easy. Groups of criminals will drive alongside motorbikes in a van and lift the bike inside using scaffolding poles. To passers by, this can look like the bike is simply being recovered by break down companies or the owner is packing it up in the van to take it to a track. This method allows criminals to steal £3 million worth of motorcycles every month in the United Kingdom, and the vast majority of bikes are sold on for spare parts, which is a simple way for thieves to make themselves some serious cash. While many garages who deal in spare parts will ask to see documentation to check that the bike belongs to them, many “experienced thieves” will know where they can take the parts and not be questioned. So how can we, as bikers, protect our machines? 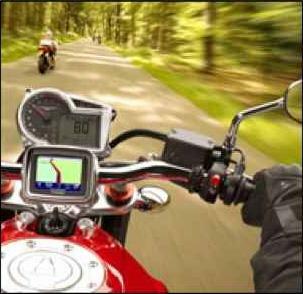 Anti-theft devices aren’t just useful on cars, vans and lorries, motorbike owners would benefit a great deal from devices such as GPS Tracking Systems. Tracking systems could dramatically increase the amount of stolen bikes that are recovered, a particular problem in France as mentioned previously. If you don’t know what a GPS Tracking System is, then think back to the film The Da Vinci Code where Tom Hanks drives off in the bank’s bulletproof van. Once the theft is reported, an electronic device was switched on which enabled them to track them down – this device was a tracking system. Tracking systems are the perfect size for motorbikes, with most being no bigger than a mobile phone, some even as small as coins, and they are easily concealed so you don’t have to compromise style for security, something which is a major concern for bikers who have spent a lot of money on bikes purely because of the paint job. Using GPS tracking systems, police would be able to pinpoint the exact location of a stolen bike, increasing the rate of recovery significantly. It’s a known fact that motorcyclists are treated with a great deal more disdain than other road users, a fact that the Fédération Française des Motards en Colère (FFMC) would quickly back up so it’s up to us, as motorcyclists to protect our bikes and find solutions to increasing bike theft.